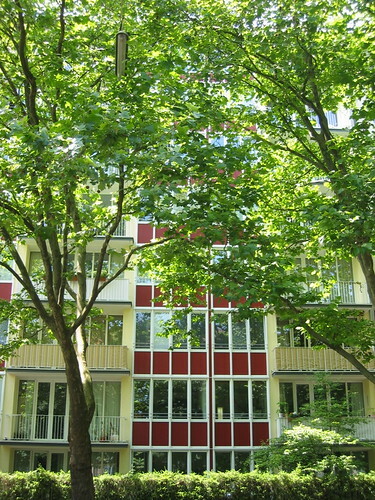 Two days before the Sep Ruf exhibition at Munich’s architectural museum will open, here’s another characteristic building of this architect: A seven storey apartment building in Schwabing that Ruf built in 1951-53. Although quite large for the surroundings, the façade does not appear in the least bulky or clumsy. The vertical line is very beautifully accentuated by the elegant white frames. At the top of the building had been Ruf’s own studio. Hello, I am working on a private photo project (website) on Sep Ruf. For its list of works, can you please name the street address of the building in Schwabing? thanks a lot! Latest next spring the houses will be postet in sep-ruf.net. Meanwhile, in about two weeks, have a look at the site for my Maxburg images. thanks for the Google Maps link. Great work! I´ll link it.